As new homeowners, Jen and Jason Campbell — founders of the popular wedding site Green Wedding Shoes — had a lot of rooms to decorate. Their home is modern and sleek, but with two cute girls, Sienna (4) and newborn Dakota Rose, they needed some kid-friendly spaces as well. 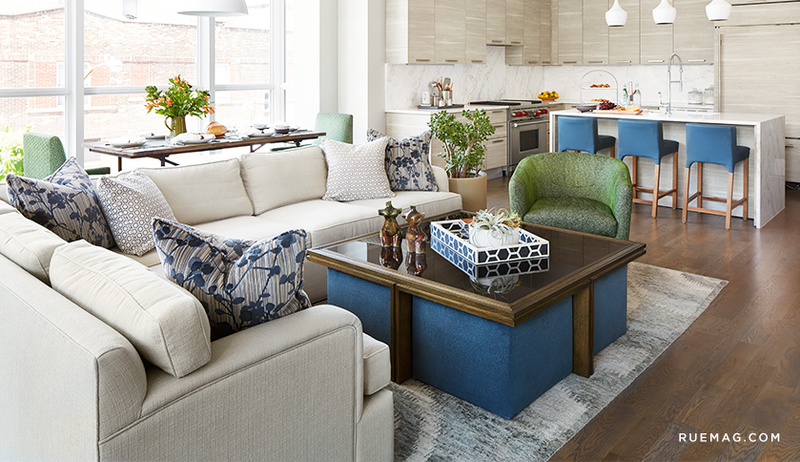 Luckily, Target Home Style Expert, Emily Henderson came to the rescue. First, she created this bold playroom using key pieces from the Target Pillowfort Collection. But what about a nursery? Hi Emily! What was your initial inspiration for this room? 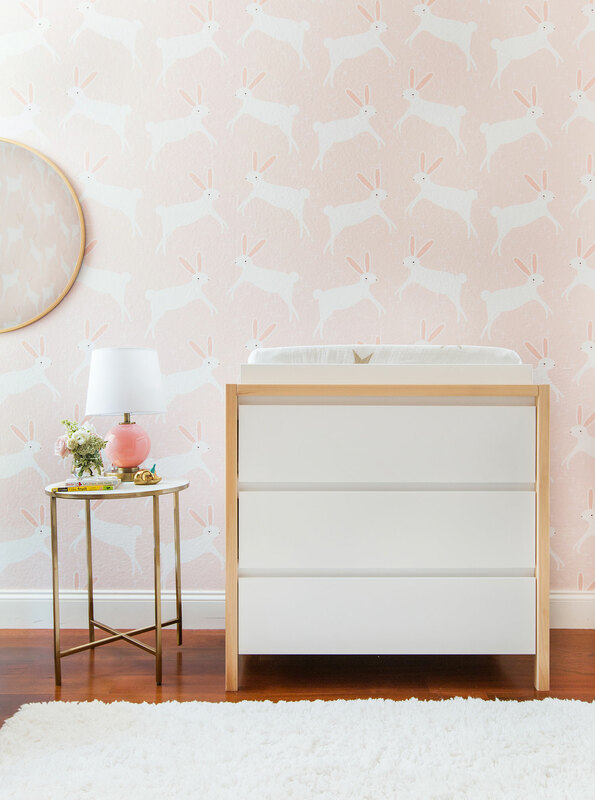 The Chasing Paper Leaping Bunnies Wallpaper (from $40) really helped us ground our design decisions and inspired the look and feel of the rest of the room. 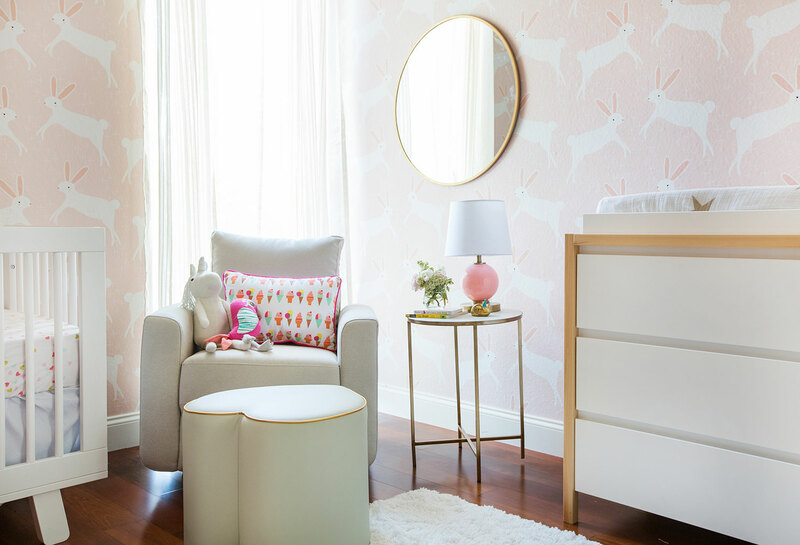 This is a nursery for Jen’s second girl, so we knew we wanted to keep the room feminine and soft but have a little fun with it. 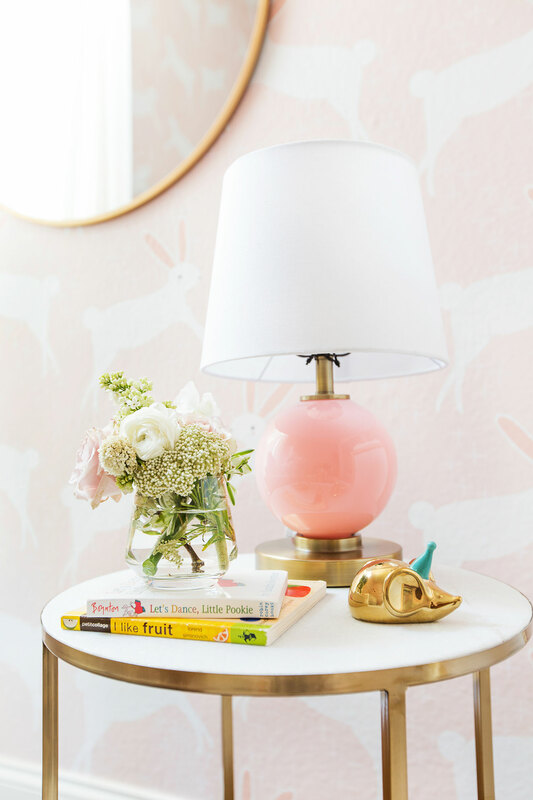 We stuck with the pink and white color scheme found in the wallpaper, and picked furniture and décor pieces that complemented it, such as the pink and white stuffed bunnies we tied back to the wallpaper. We love it! How did you find the bunny wallpaper? We were looking for something unique, sweet and eye-catching. Chasing Paper is a company that produces a lot of really great temporary wallpaper with fun graphics that work on nearly any surface. 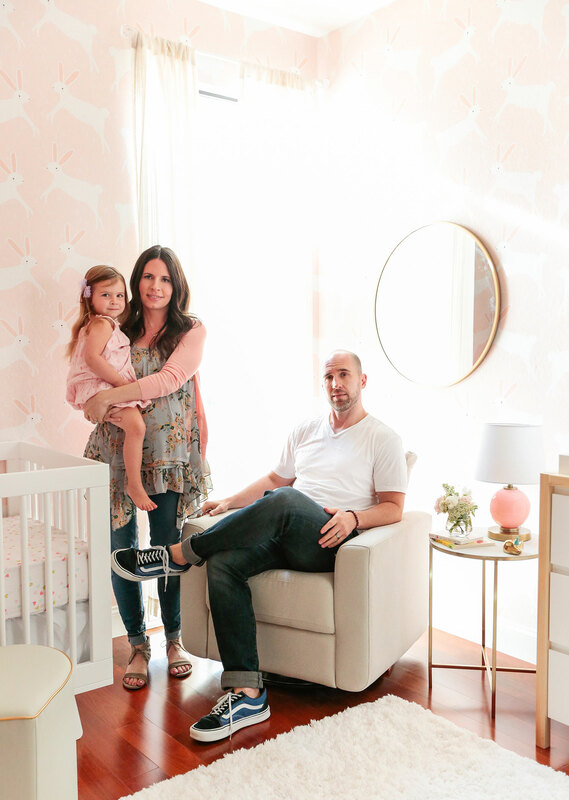 With the wallpaper, Jen and Jason were willing to go bold, but given the nursery will eventually become a guest room, we wanted to give them the option of keeping or easily removing the wallpaper once Dakota outgrows the space. 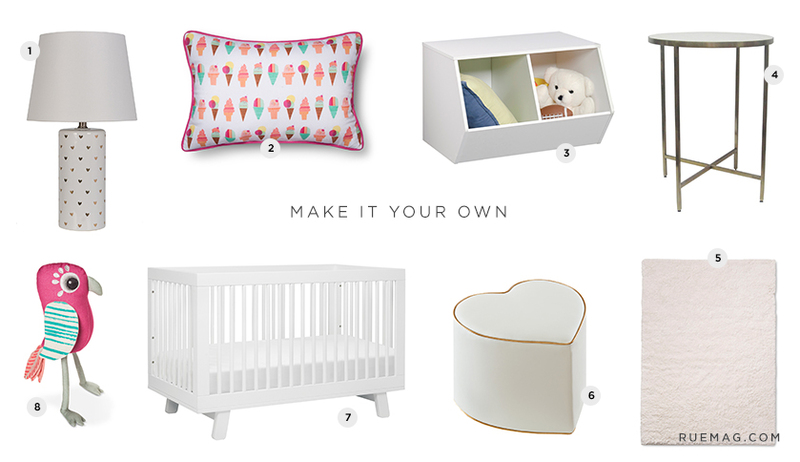 Aside from the obvious (crib, changing table), what do you think every nursery needs? Every nursery needs a glider – let’s be real, it’s where mom spends a lot of time cuddling her newborn, so it better be comfortable. Luckily, there are a lot of sophisticated options available so you don’t need to sacrifice style for comfort. 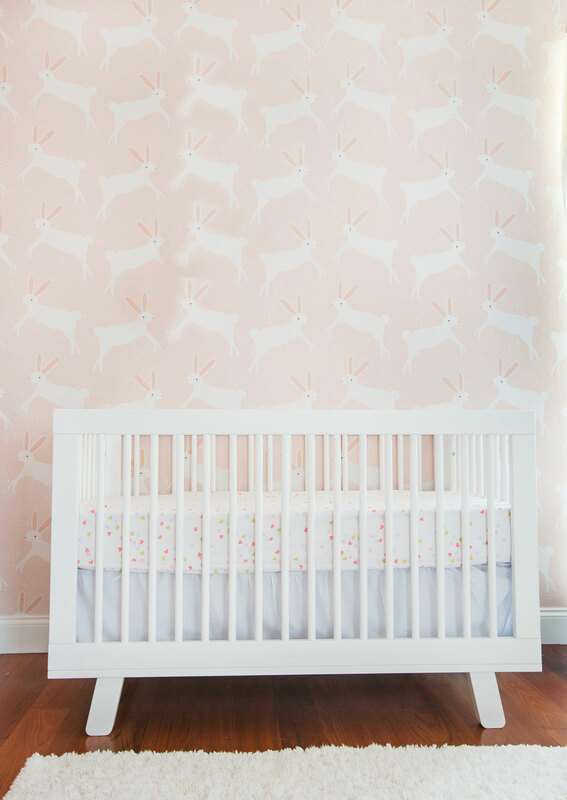 I also love patterned and graphic crib sheets because they’re an effortless way to add a pop of fun color to the nursery but easy to swap out if you’re in need of a change. Do you have a favorite product or piece in the finished room? I love the Babyletto Hudson 3 in 1 Convertible Crib ($379.99) – I actually have this in my own home for Elliot as well. The Babyletto Bento Glider ($349.99) is another a great piece – it is super comfortable but still a goodlooking chair. I also used a few pieces from my friend Joy Cho’s Oh Joy! for Target home and nursery collection like the Party Mouse Figurine ($14.99) and Heart Ottoman ($59.99) – the pieces work well within the existing space and add a little fun and personality. 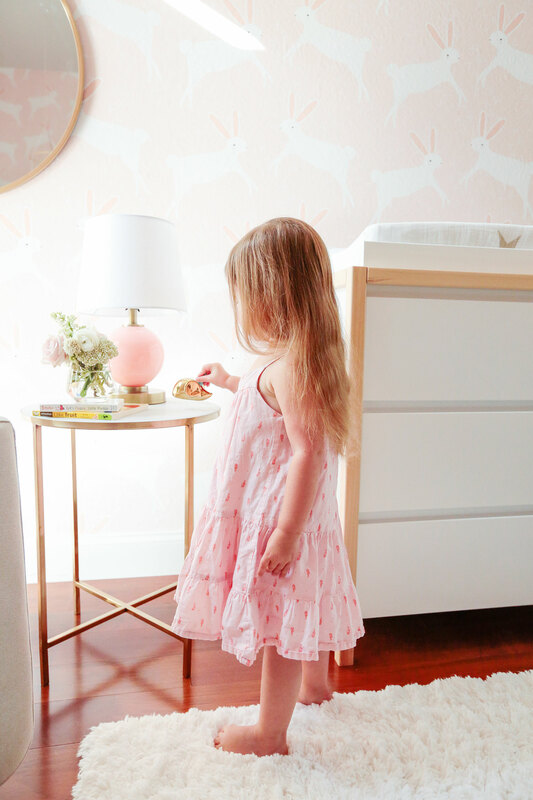 There are a few products I loved so much that I ended up using in both Dakota’s nursery and Sienna’s playroom – the Pillowfort 2 Pack House ($19.99) and Pillowfort Column Table Lamp ($44.99). These are pieces that work with kids of all ages.